Protesters in western North Carolina rally against Duke Energy’s plan to install power lines across private properties. Courtesy NC WARN. In 2015, Duke Energy’s state-sanctioned monopoly in North Carolina faced a pair of very different challenges from two vastly different communities. 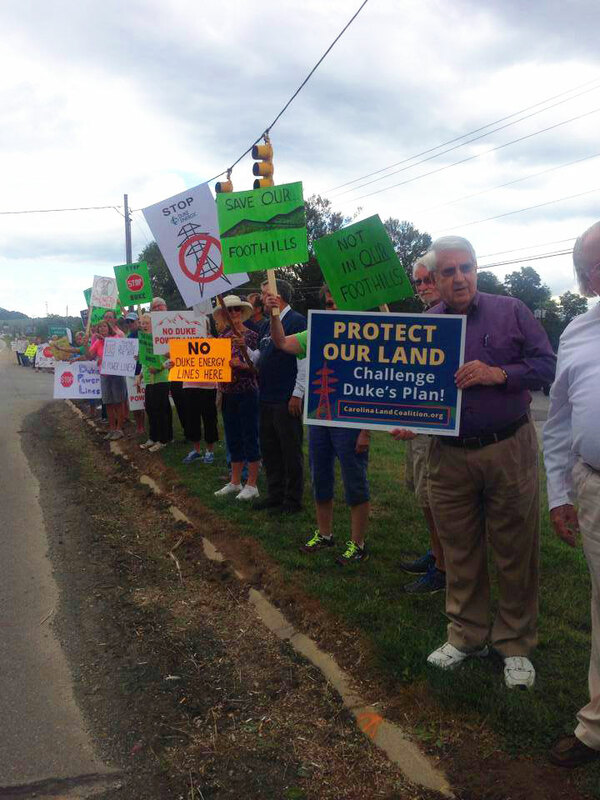 In western North Carolina, thousands of people – mostly White, middle-class, with little organizing experience--turned out in droves to attack Duke Energy’s plans for their beloved mountains. Two hundred miles away in Greensboro, a Piedmont church – serving a mostly Black, low-income community with a history of activism and advocacy stretching back decades – simply put solar panels on its roof. The outcomes of these community challenges – the former a victory, the latter (at least currently) a defeat – raise critical questions about the future of renewable energy in North Carolina, and the power of grassroots campaigns to determine its fate. Last summer, my mother called me in a frantic panic. She’d gotten the same letter that Blackwell had. The letter announced that Duke Energy would be considering our land as a site for their new transmission line. If this occurred, my parents would sell their home – they’d move. I couldn’t imagine my parents living somewhere else, or imagine not being able to truly go home again. So, like thousands of others in western North Carolina, I began to organize. Even though I didn’t really know where to start. This planned transmission line constituted part of Duke Energy’s Western Carolinas Modernization Project. Their plan involved replacing a coal plant in Asheville with a natural gas facility, which at first seemed like a victory for Duke Energy’s opponents. Environmental activists had long railed against the filthy Asheville coal plant and, finally, it was going offline. However, to accompany the natural gas facility, Duke Energy proposed a new power line, a 40-mile monster that would stretch from Asheville to Campobello, South Carolina. In order to meet federal reliability standards, the company said, the transmission line had to be built. Stopping Duke Energy has become something of a Herculean task in North Carolina. With a state-sanctioned energy monopoly, a former employee of 28 years in the governor’s mansion, and millions in political donations flowing into the pockets of decision makers, the utility company has enmeshed the state in its corporate interests. While the state government has the duty to rein in Duke Energy when its plans do not serve the interests of the people, that duty has not been fulfilled in recent years. Organizations like the Carolina Land Coalition (CLC) quickly materialized across the region. Homeowners’ associations formed networks, linking together previously unconnected neighborhoods. But almost immediately, the burgeoning movement faced a potential existential crisis. “I’m a classic NIMBY—not in my backyard,” Baird Blake told me. Blake began to organize his neighborhood almost immediately, concerned that the lines would crater his property value. But the company had bothered all those people. And even as the movement threatened to fragment (Blake found many of the environmental groups organizing against Duke simply “too tree-huggerish” and impractical for his taste), organizations and local individuals became more and more active, more and more vocal. “These aren’t people who are just protesting something to be protesting,” said Joan Walker of Mountain True, a western North Carolina environmental non-profit. Though their politics are disparate, their interests converged for multiple reasons and across multiple spaces. Much to its chagrin, Duke Energy had mobilized a mass of mostly White, property-owning people into the streets, parading and protesting its plans. That same summer, half the state away in Greensboro, a climate justice non-profit called NC WARN partnered with Faith Community Church and its sister organization, Beloved Community Center, to install twenty solar panels on the church’s roof. In 2015, one would not expect this to be newsworthy. Solar power has become prevalent across much of the United States, and in North Carolina, solar has grown quite rapidly in recent years—in many aspects, because of Duke Energy. North Carolina is one of the top five states in the nation in terms of currently installed solar. As recently as 2014, North Carolina added nearly 400MW of solar capacity, the second most in America during that year. Yet, this one small church installing a few solar panels triggered a legal fight that could greatly improve access to solar energy in North Carolina. This is due to the nature of the third-party Power Purchase Agreement (PPA) reached between NC WARN and Faith Community Church. This type of agreement involves a residence or business simply paying the owners of solar panels (in this case, NC WARN) for the power the units generate, rather than buying the panels outright. This helps churches, schools, and homeowners avoid the prohibitively high upfront costs of solar power. Yet, North Carolina is one of only four U.S. states that currently does not allow third-party sales. The Faith Community Church “test case,” as NC WARN Director Jim Warren calls it, has the potential to change that. Duke Energy disagrees. “The way the rules were written in North Carolina, you cannot just set yourself up as an electric utility unless you’re going to follow all of the rules of being an electric utility,” Duke Energy’s Randy Wheeless told me. He suggested that NC WARN is not following the established rules, and he called the test case “not so much a solar issue,” but a legal dispute over regulation. If they have any hope of ultimately winning this battle, NC WARN and Faith Community Church will have to overcome a regulatory board, a legislature, and a state government that has, for years, let Duke Energy do with North Carolina as it will. “Control” is a word that kept coming up when I spoke with people about Duke Energy. The company’s business model only works if people have very limited choices for power. It can only build expensive new plants and then justify raising rates if it can present these as necessary for providing power for the citizens of the state. But if it becomes easier for people to produce power on their roofs, or if people take it upon themselves to be more energy efficient, Duke Energy’s control starts slipping away. In North Carolina, the company’s political influence does much to ensure that their control remains unimpeded. Duke Energy’s PAC is one of the largest corporate donors to North Carolina General Assembly candidates, and many of their top executives donate individually as well. They are major funders of Tom Apodaca, who introduced a bill that fast-tracked the company’s current plans for Asheville through the North Carolina Utilities Commission, the state’s main energy regulatory board. Politicians that have taken on Duke Energy in the legislature, even with bipartisan support, have had their efforts stymied by politicians funded by the company. State Representative Chuck McGrady, who has sponsored third-party solar sale bills in the past, says of their failure, “Duke Energy and other energy companies in the state were utterly unwilling to negotiate.” And so, the bills died. Furthermore, the company has done its part to fund the political career of North Carolina governor Pat McCrory – a former Duke Energy employee himself. In 2014, as Duke Energy negotiated with the state over the price it would pay for pouring 39,000 tons of coal ash into the Dan River, company money began to flow to one of McCrory’s major backers: the Republican Governor’s Association (RGA). The RGA is one of the biggest bankrollers of McCrory’s political career, spending $9.6 million on McCrory’s two gubernatorial campaigns (in 2008 and 2012). Although Duke Energy historically had not been a major donor to the RGA, that changed in the wake of the coal ash scandal. There are no illegal ties between these contributions and McCrory’s actions. But how can there not be a conflict of interest when Duke Energy donates significant sums to a major political funder of the man charged with regulating the company? While in office, McCrory has leveled what some see as mere “sweetheart” fines on Duke Energy for their pollution. He has also appointed other prominent Duke Energy alums to powerful positions, and granted them secret, face-to-face meetings in the midst of the company’s scandals. He has also appointed five of the seven members currently serving on the Utilities Commission. Duke Energy has done a lot to put, and keep, Pat McCrory in office. Based on his actions, it sure seems like he’s returning the favor. As summer turned into fall, Duke Energy’s website was flooded with notes from concerned residents in western North Carolina. In an effort to explain their plans, the company scheduled public hearings. Phoebe Blackwell didn’t think much of these meetings: “There was no one to say anything directly to. There was no place to put complaints… and they did that, I think, on purpose.” However, she thinks the company made a mistake: “They don’t know how smart mountain people are,” she said. The economic progress has already come to North Carolina. “There’s roughly 6,000 solar jobs here in the state,” said Rogers of Environment North Carolina, “and it’s one of the fastest growing sectors of our economy. Also, in a number of cases, the solar farm, once built, becomes the biggest taxpayer in the county.” Rogers sees expanded solar growth as a potential source of jobs that can help replace fading industries such as the furniture industry and, possibly, the fossil fuel industry. With solar energy and greater energy freedom, North Carolina could have cleaner, cheaper power and more jobs, two developments with the potential to greatly help low-income areas – something all North Carolinians should favor. Yet, for the time being, solar’s expansion will be curtailed, and will only come on Duke Energy’s terms. In April 2016, the Utilities Commission ruled against NC WARN. It determined that Faith Community Church sat in an area that “has been assigned exclusively to Duke,” and therefore that the environmental nonprofit could not sell the church power. While the Commission did not seek to take away the church’s solar panels (suggesting that NC WARN could simply donate them), it did threaten to punish the organization by levying a fine of $200 per day for each day that NC WARN sells power to the church. This would equal a penalty of about $60,000 – the kind of penalty that could severely threaten the organization. While NC WARN does plan to suspend sales to the church to avoid larger fines, the April ruling is by no means the end of the fight. Now, NC WARN plans to appeal the decision in the state Court of Appeals and, if necessary, with the North Carolina Supreme Court. At this point, neither side can give up: “There’s too much at stake,” says Warren. This grassroots movement in western North Carolina saved my own home from being devastated. It also showed that the people of North Carolina can still win victories against Duke Energy. But, as with most things, more work remains to be done. This effort grew so quickly and had such staying power because so many people’s homes could have been impacted – Duke Energy was right in saying that if only one route had been chosen, far fewer people would have been upset. In that case, the company likely could have built their lines without a huge uproar. And if that’s what it takes—a direct, demonstrable threat—to motivate people to show up, how will movements about less visible issues gain the sustained, large-scale support needed to impact decision-makers? In Greensboro, it is going to take more than a small amount of energy to win the legal fight that is coming. Still, even if their efforts flame out in appeals court, the people of NC WARN and Faith Community Church will inevitably find another way to fight against Duke Energy’s monopoly.